Public Service Announcement: Wheaties Fuel is a great tasting cereal. This is an important message because you don't really get a sense of what this cereal is like from the box or from commercials. 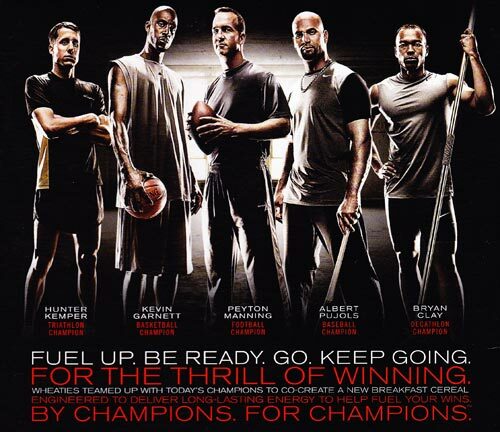 The story of Wheaties Fuel is that it was created by 5 world-class athletes and 1 esteemed sports nutritionist as "the first-ever cereal designed specifically to help fuel wins". It's a nice story (more here). General Mills starting telling it months before the cereal was officially created. But one does not eat stories. As I sat down to breakfast, Football great Peyton Manning stared at me from the strangely futuristic box, his steely eyes piercing the shadows of a black background. He looked serious - maybe even angry. This was a cereal with attitude. What does edgy taste like? On the side of the box, Mr. Manning was holding a bowl of the cereal in a shadowy, half-body shot. The lighting distorted his face. I was reminded of the 1932 film Freaks - a mental image made more "freaky" as I recalled other cereal characters like Sugar Bear and Papa Smurf. 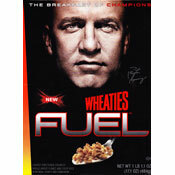 In this pose, Peyton Manning seemed to be thinking, "Eat this cereal or I'll make you eat it." Attitude. Edgy. I took a bite. This was not a dark and serious flavor. This was more than fancy packaging, marketing hype and image. This cereal was delicious. Despite the darkness of the box, Wheaties Fuel was fun. I pushed the humorless quarterback out of view. Wheaties Fuel is one of the best tasting cinnamon cereals introduced in recent years. There's nothing subtle about the flavor. It's Cinnamon with a capital "C". I was really surprised how sweet this cereal was. I found it tasted sweeter than Cinnamon Toast Crunch and a number of kids cereals. That sweet surprise may not seem so sweet when you consider that Fuel has 10 grams more sugar per serving than regular Wheaties and 4 grams more sugar per serving than Cinnamon Toast Crunch. Set aside for a moment that Fuel might not be as nutritionally perfect as its marketing implies. This cereal has a great texture with an interesting crunch. Fuel is comprised of traditional Wheaties-type flakes and crispy rice pieces. The two pieces work great together and both retain a significant crunch in milk. I was reminded of Optimum cereals from Nature's Path, usually very good cereals, but their multi-textured pieces always hinted to your mouth that you'd chosen a healthier cereal. Fuel offers the same multifaceted texture, but never feels like a healthy cereal. That may also be because Fuel isn't quite as healthy as its marketing implies. While I was disappointed by the high sugar content of Fuel and a less-than-stellar showing in dietary fiber (5 grams), this cereal does have some nutritional high-points. It offers 100% daily value of 5 B-vitamins and 0 grams trans and saturated fat. The first ingredient listed on the side panel is whole grain wheat. Unfortunately, sugar is third. One 3/4 cup serving did fill me up until the lunch and I may have noticed a slight energy boost from the B-vitamins. I'm giving this cereal a perfect score for flavor and texture. But I have to take at least one golden egg away for the deceptive sugar content. Overall, I recommend trying Wheaties Fuel. I suspect if General Mills were to repackage this as a cereal with flavor and substance instead of just attitude, Wheaties Fuel could be around for a couple years. What do you think of Wheaties Fuel? Rater missed the point. A serving is 1/4 cup having 14 grams of sugar. He ate 3/4 cup so that is 42 grams or more than 7 teaspoons of sugar per your serving! NOT too sweet? Aiming for obese children? This was the BEST cereal to have with fresh fruit and yogurt for breakfast... too bad they quit making it. I like it! Made my power breakfast of bacon, eggs, toast, grapefruit and Wheaties Fuel. I will enjoy this cereal as an occasional evening snack too. Wheaties Fuel is geared toward ATHLETES! Athletes NEED the extra carbs. It's quite obvious that many of you are unaware of sports nutrition. This cereal has the perfect carbohydrate content for an athlete. If you're not an athlete, stick to the original Wheaties and STOP complaining about the sugar content of Wheaties Fuel! Count me sold. Tried it for the first time this morning. Hope it stays around for a long time. Athletes don't eat cereal. Fuel tastes great because of the sugar. Texture is enjoyable. Cereal eaters are too lazy to whip up a truly nutritious meal so stop whining, add milk, and yummy it up. Ugh... just tried a sample box and could not finish it. Too sweet. Good cereal but I don't see it sticking around for very long. Doesn't seem to be catching on, the local salvage grocery sells it for $0.69 a box. It ain't bad for 99 cents but maybe General Mills won't make enough to keep it on the market. Just finished a bowl.... thought, tastes to good to be healthy. Way too sweet. A good idea but the sickly sweet taste ruins the product. I tastes very good and seems healthy. Most stores have stopped putting it on the shelf?? Why? I really liked it. It was a dollar more than regular Wheaties. That I didn't like as much. This cereal is awesome! You say it looses points for having to much sugar but its designed for athletes and for us sugar = carbs which is a very good thing. I have never liked Wheaties when I was young I am now almost 70yrs old I really liked the taste probably because of the cinnamon that I love but like the reviewer said it has to much sugar content if they could reduce it to a moderate level and keep the same flavor which I am sure they can do in their labs I being a borderline diabetic would not be able to eat on a regular basis. Again if a change in sugar content I would change my purchase of cereals. Too sweet. Too orange in color. The little rice pieces remind me of spider egg pods or an insect. Black box packaging is "dark and sinister." A good cereal for Halloween. This is an "over-hyped" cereal, not a "good-tasting" cereal. Definitely designed for the younger, commercialized, easily influenced, Red Bull crowd. If you love Wheaties, you won't like this. I don't believe most of the positive comments on this site, and I think they are from General Mills employees. Bottom-line, it doesn't taste good... isn't that what really matters? I just got done chowing down on this. It's easily my most favorite cereal ever. A little on the expensive side if bought at retail price, but it's definitely worth it! I never liked the original Wheaties, but the alternative brand they came out with a while ago, and this new "Fuel" variation, well, they are both DA BOMB. "Fuel" just tastes perfect; I can't help but eat about 2 cups worth every day (unless I eat pancakes with them, then it's usually just a serving size). Yummy yummy in my tummy! I liked it except it is too sweet and I wish it contained folic acid. I like the vitamin content and fiber. Pretty good taste. This is the best cereal that I ever had. It gives me a jolt of energy in the morning and also provides me with the vitamins & nutrients that my body needs to complete my day. It's the best cereal in my life. It is awesome. enough said. I added a banana to soften up the heavy sugary taste and ate less than a full bowl. Texture is great, no soggy cereal here and as I look at Peyton Manning mean mugging on the box I can help but think of his skits on SNL. Awesome. When a new cereal made by General Mills becomes available for $1 at Big Lot Stores, I begin to worry! I gave it a try, and it seems the sugar, cinnamon, and vanilla is FAR too overly done. With it's tough texture, and very sweet taste, I couldn't have done worse if I put Cracker Jacks,or graham crackers in a bowl of milk and ate them. It's not the WORST cereal ever, but, it does nothing to set itself apart from the average cinnamon/vanilla/sugary/clustery, semi-nutritious cereal! I'm sticking with regular Wheaties! I add blueberries and a small bananna its the bomb plus its only 99 cents what else do u want. I got my box from the 99 cent store here in Santa Monica!!! Tastes good too... !! This cereal to me tastes just like rice pudding. I am an avid cereal eater and the crunch lasts far longer than any other cereal I have had. Very filling also. So you USED the #2 GUY? What are you THANKING?? By the way Mr. Breakfast lame, lame, LAME!! Man, you are crazy. sweeter than cinnamon toast crunch? Yeah right! This cereal is ok at best. I just eat it because its somewhat healthy. There are alot of better tasting cereals out there though, and in all reality, there are alot of cheaper cereals that are just as healthy also. Taste Great? duh! Spend 3 bucks, eat some, and find out for yourself. The box? Its marketed to a certain group and you probably fit the bill if you actually came to this page and are reading this (take that into consideration if you actually make decisions after reading other peoples reviews). Yeah, it could be more nutritional, but its a safe selection over say... bacon and buttermilk pancakes. I mix it into yogurt as if it was granola, tasty tasty! Wheaties Fuel is a classic example of the saying, "If it ain't broke, don't fix it". After eating and loving Wheaties regularly for as long as I can remember, (I'm 77) and considering it to be the best cereal ever invented, I was expecting this new Fuel to also be great. It turned out to be a huge disappointment. The flavor is gross, the texture is gross and I could hardly eat the whole bowl-ful. I am debating whether to throw it out or try to use it for bird food. I also detest the dark, sinister look of the box and the pictures of the athletes depicted thereon. General Mills should be ashamed for departing from a wholesome and inspiring look to a dark, evil appearance. I love it, and there are $1 off coupons everywhere. For all of you saying this cereal tastes good, get off Wheaties payroll. This tasted like one of those cheap generic versions. Sorry. I love Wheaties, and like the idea of an energy packed cereal... but I do not believe this it it. I eat this cereal and am hungry again in about an hour. I also do not believe the cereal tastes as good as many of the other reviewers. I agree it tastes like cinnamon, but otherwise... not great. Unfortunately, folic acid is NOT one of the B vitamins included in the 100%. So women... sorry. Stick to the regular wheaties. Other than that, I was pretty disappointed in the fiber content. I usually like a cereal with at least 5 grams of fiber. But it did taste good. I had the opportunity to try this cereal a few weeks ago. I agree that it taste was exceptional. The amount of sugar doesn't bother me. I've been looking for a cereal for active adults that has all the nutrition I need but also tastes great. It's like eating my favorite cereals from my childhood but with added vitamins, minerals, carbs, and fiber. I should also mention that the branding made me feel like I could take on the world.